For many years New Zealand aligned itself strongly with Britain and had few bilateral relationships with other countries. In the later 20th century, relationships in the Asia–Pacific region became more important. Involvement with multilateral organisations remains a vital way for a relatively small, remote nation to achieve its foreign-policy objectives. developing international rules and standards. Before the Second World War, New Zealand had only one major overseas post, in London. The Department of External Affairs was set up in 1919, but focused on territories in the Pacific. In 1920 New Zealand became a founding member of the League of Nations. 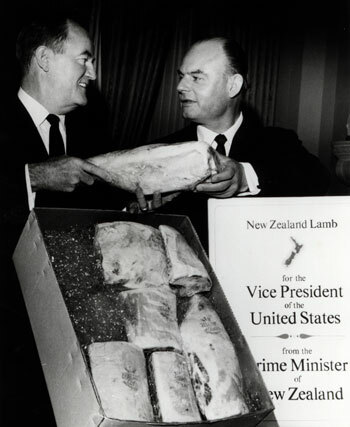 New Zealand sought closer relations with the US, and established diplomatic posts in Canada, Australia and the USSR. In 1943 an External Affairs Department with a broader focus on relations with other countries was set up. In 1945 New Zealand was actively involved in setting up the United Nations (UN). Over time, missions were set up in more countries. From 1950 New Zealand was part of the Colombo Plan, which assisted developing countries. In 1951 New Zealand, Australia and the US signed the ANZUS defence treaty. In 1954 New Zealand joined the South East Asia Treaty Organization (SEATO), which aimed to strengthen security in the region. Diplomatic posts were established in Asian countries. Britain took most New Zealand exports, but this was threatened when it joined the European Economic Community (EEC). New Zealand worked to protect access to British markets, and to find new markets. New Zealand administered Western Samoa (which became independent in 1962), the Cook Islands and Niue (which both became self-governing in association with New Zealand), and Tokelau. In the 1960s and 1970s the public became more interested in foreign policy, due to the Vietnam War, sporting ties with South Africa and nuclear testing. New Zealand is active in multilateral organisations (those that involve a number of countries), such as the United Nations and the World Trade Organization. These negotiate norms and rules on issues such as trade, human rights, the environment and arms control. The Ministry of External Relations and Trade was set up in 1988, and became the Ministry of Foreign Affairs and Trade (MFAT) in 1993. In 2011 New Zealand had diplomatic relations with around 150 countries.